One year it was Kate Rusby, another Luke Concannon and another Ed Sheeran. This year it was Joshua Hyslop and his album In Deepest Blue. Every year it has been music that has reconnected me to myself during our summer holiday. Each time I remember things that I commit to never forgetting again. And yet each year I realize again that I forgot. Things really about the heart. About simple presence, vulnerability, feeling. On holiday I realize how much I need to decompress. Decompress from the doingness, the digital and the drive. Things I am not aware of being compressed by when I’m in them, like the fish in water. Things normally crack around day three. This year my insights were in particular around how much it asks of us to be in a bridging role in this Great Transition. Somehow I imagine it must be easier to either unconsciously be in the old system or to be opting fully for a radical alternative outside the current system. I was realizing and feeling how much pain I hold in that bridging role, around all the compromises we consciously make as we attempt to straddle two worlds, finding a way to channel the energy and attention of a world that is dying into a world that is just being born. Walking round the supermarket I got depressed at humanity’s stupidity as we eat ourselves to an early and often painful death, destroying the ecologies of other species in the process. Sometimes I really wonder if all our efforts aren’t just vain attempts to make ourselves feel good. I was reminded of the great compassion we need with each other as our shadows are triggered on the paths of our passion. We know we need to heal ourselves to create the healing in the world we so crave. I feel the pain of the world and yet park it in order to focus on building the future. Yet it’s important to take the space to connect regularly to that pain and let it flow through. Otherwise it builds up and becomes increasingly hard to access. It’s so important to be kind to ourselves and our bodies, as well as to each other. Those of us who are in clear space need to help others who are temporarily out of balance to ground and reconnect. We all go through the cycles and need to learn to support each other as we can – and know that we all have ups and downs. Fulfilling the promise and potential of our higher selves requires us to move through the pain we hold. The path is indeed the way. We never arrive. We just spiral on through plateaus of relative flow and uncomfortable rapids of transformation. If we can remember that of ourselves and others, we’ll have a greater chance of more gracefully birthing the world we’re working for. A few years ago I wrote a book called The Pain and the Promise which went into this process in detail. I never had the bandwidth to get it published but I do have a recent draft with comments from the potential publisher (Russ Volckmann actually who just passed away, which is a great loss), and would be happy to send it to anyone interested. I’m also really enjoying a great book by Penny Kelly called Getting Well Again, Naturally, which is a strong reminder of the the discipline we need to have in making the lifestyle choices we make – with some surprising but very resonant advice. Driven to despair by how my smart and sensitive eldest son was suffering from increasing stress and depression by the mind-numbing rote-learning and non-step testing regime at his apparently top secondary school in the Netherlands, I googled in Dutch “education without tests”. Up popped the page of a tv documentary about a school in Roermond called Niekee where they had been experimenting with an approach called Agora. As I read the interview with one of the co-founders, Sjef Drummen, my eyes filled with tears as I recognised the secondary education of the future that truly honours and liberates the wholeness and potential of our children. The old system is broken and it’s breaking our kids. I was determined to do what I could to bring it to my home town and so earlier this week I visited Sjef and his amazing school. I feel immensive gratitude for the vision and courage he and his team have shown in actually manifesting a working example of how it could be done differently. As he repeated a number of times to me, “what we care about is what is good for the development of the child”. 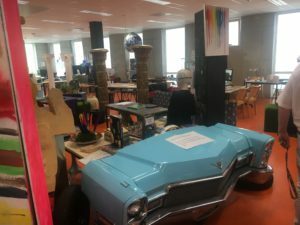 Below is some more information about Agora that I have translated from various Dutch sources, and some photos of the children’s working spaces (that they get to design themselves). [Note – this article references the Spiral Dynamics model – see http://spiraldynamicsintegral.nl/en/ for more background]. Trump was always going to beat Hillary. His energy (strong Spiral Dynamics Red Power Gods wrapped in successful Orange Achiever-self) resonates with the US population much more fundamentally than hers (Spiral Dynamics Orange-Green smart political correctness). Now Bernie would have given Trump a run for his money, due to his access to the more fundamental value systems. But the democratic leadership was blind to that reality. It is also part of a trend – disillusion with a cognitive elite that has lost touch with people’s need for simplicity, identity and deeper meaning. Before a system makes a major leap, it often has to regress in order to gather more fundamental energy from the past that it has left behind, split with or repressed. Think of bending your legs before you jump. In the Netherlands that happened a number of years ago when following political murders, the country regressed to an order-driven party (Spiral Dynamics Blue) and Prime Minister (Christian Democrats with Jan-Peter Balkenende). He got in on a return to core values. The Netherlands is a more feminine we-centered nation than the US. The US is more masculine, individualistic and expansionist, so a regression in the US was far more likely to express itself through an “express-self” value system (e.g. Red Power Gods) than a “sacrifice-self” value system (such as Blue Order). Hence Donald Trump. The good news is that the Netherlands then went on to elect the most Integral Prime Minister in their history, Mark Rutte. Having re-stabilised and integrated the earlier Blue order-driven value system (which had been largely suppressed by Green egalitarianism), it had the energy to push beyond Green in Yellow Integral. Whether that is the promise in the US remains to be seen, but it might help to see it in this perspective. From a volutionary perspective (www.volutiontheory.net), what we are seeing is indeed “regress to progress”. This will amplify the polarities. When you stretch the poles, it increases the flow of energy in between. The implications are that we can expect increased instability and turbulence, but that means increased energy in the system that can create more fundamental change. It also brings more risk of course. Will the system be able to hold it and ultimately channel it constructively? Will decisions on for example climate change taken by a republican-dominated US led by Donald Trump damage our ecosystem to an extent that massive human conflict and suffering become unavoidable? We will see. Life will continue its quest for a dynamic balance and general directionality of increasing differentiation and interconnection. We are a resilient expression of life. Let’s stay as centered, clear and compassionate as we can, and keep taking the next natural step towards the kind of future that sings in our hearts. Life will take care of the rest. From a volutionary perspective, between the undifferentiated oneness and the personified I-ness, or the wholeness and the “partness” of a system, there is a large range of dynamics that go on in the relative space. People use many different languages to describe the work they do and the theories that underpin it. To help clarify the relationships between these different practices and frameworks, I will refer to three main perspectives that end up creating different languages and cultures in this area, so we have a code for deciphering the various ways of describing the same context. These perspectives are based on the three persons – 1st person, 2nd person and 3rd person. The 1st person is the “I” and is the subjective experience and perspective. The 2nd person I will refer to as “We” (in the tradition of Ken Wilber 1995), because it is really about the interaction between “I” and “You” in a “We” space. The 3rd person is the “It” and the apparently objective perspective on something. Here are some examples of the way these show up in theories and practices around energy and information. 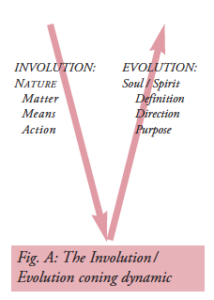 In a third person perspective one would talk about energetic functions, the way information and energy works, similar to the way I have described volution above. 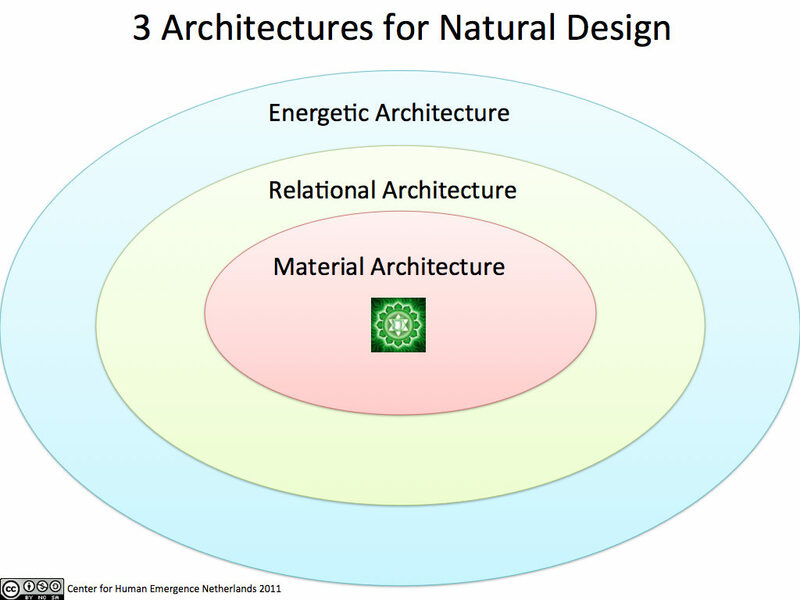 It is all seen as a system with different elements and processes that interconnect. Richard Leviton (2005, 2007) describes the various functions that he encounters at specific physical sites on the planet – such as connecting different sites and functions to each other, channelling information into matter, protecting certain areas, providing access to certain informational realms. Hans Andeweg (2009, 2011) describes specific parameters of a system, such as orgone (life energy), oranur (stressed energy), dor (blocked energy) – these last three coming from the work of Wilhelm Reich – grounding, bovis (integration of concept and realization) and POA (Percentage of Organization and Adaptation). In Andeweg’s ECOintention practice, these parameters are measured and used to influence the kind interventions that are made. The third person perspective tends to focus on making pro-active interventions – such as healing a place in Leviton’s work or balancing an organization in Andeweg’s work. In a second person perspective, one would talk not about functions but about other entities or beings that one interacts with – nature spirits, angels and devas, for example. Leviton (2005, 2007) links the functions he describes to certain entities, such as gnomes, angels and dragons which you engage with when looking to activate certain functions (Merry 2011b). Small Wright (1997) describes ways to work with devas, nature spirits and angels to help co-create a reality that connects your intentions with what is best for life as a whole. She also assigns certain functions to the different entities. The second person perspective tends to focus more on co-creativity with other beings and aspects of life. In a first person perspective one would talk more about the inner experience one is having. This is seen more often in receptive practices where the task is to pick up information intuitively from various channels. In Leviton’s workshops, for example, he has people focus on certain locations and report what they feel. Although people may use slightly different language, there is usually a common theme. Gnomes for example create quite a different felt experience than fairies or sylphs. Andeweg also has people feel different energetic qualities and then compare notes inter-subjectively, as part of his four year vocational training in ECOintention. The first person perspective tends to focus more on receptive practices. Different people and different schools tend to have different preferences for the three perspectives. One will talk in more “objective” third person terms about the functions of an energetic system, and may get irritated by “new-age waffle” about angels and fairies. Others may feel more comfortable with a second person perspective in the realms of beings and entities, and find the third person too cool, heady and disconnected. Still others may say it’s all subjective anyway and you just have to feel it in your own body-mind, a first person perspective. More often than not, people and schools combine these perspectives to some extent, as we have seen in the examples above. However, it is important to be able to see them as different yet complementary perspectives on the same reality, and it is in that spirit that I will go into more detail on some practices below that are exploring how to access a fuller spectrum of the volutionary process. “Can you coax your mind from its wandering / and keep to the original oneness?” the Tao te Ching asks (Lao Tzu, 1999). This points to the place of inner stillness from which we can access field intelligence. The field is a field of information and potential energy, as described in quantum physics. The moment that we observe this “quantum” field with our cognitive mind, the potential wave form becomes a coherent wave form, meaning that we can never actually access the quantum potential state with our cognition (Talbot 1991). This is why we need to still our analytical mind and light up our more intuitive senses to be able to access this field (Andeweg 2009). When our attention is focused on the world of things around us, we are paying attention to the disorder and amplifying it in our experience. To generate more order in our experience we need to go inside and pay attention to the generative reality. Greater presence creates greater order, allowing life to close the loops of the cycles between order and disorder more quickly, integrating action and awareness, or doing and being, in more rapid feedback loops. The Tao te Ching is essentially a guide to accessing that inner state of being present. This concept has been popularised in the world of organisational development in recent years by the work of Joseph Jaworski, Peter Senge, Otto Scharmer and Betty Sue Flowers, as what they call “presencing” (Senge et al, 2004). It is what Scharmer calls the “blind spot of leadership”, that ability to find inner stillness and deep knowing that guides us to take wise and better informed decisions. In Ervin Laszlo’s understanding of what he calls the Akashic Field (Laszlo 2004), there is a field that holds all the information that has ever existed and information of the dynamic potentiality of future possibilities. We can access any knowledge we want by attuning ourselves to this field and asking clearly what we want to know. To do this however requires that we activate our intuitive dimension and quiet our rational mind. The rational mind does have a role in working with information gathered from an energetic field. Information from a field can come to us in many different forms. Sometimes in words, but also in images, feelings or other sensations. Each individual needs to work out what their intuitive language is, and what different sensations actually tell us. This is where the rational mind comes in. 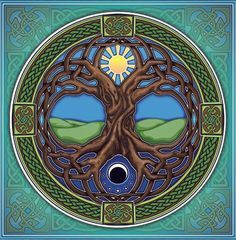 Energy has many different qualities and functions, and to be able to interpret, communicate about and work with energy, we need to be able to discern those diverse qualities. Working with a shared conceptual framework of energetic terms, such as that developed by Hans Andeweg in his ECOintention practice (Andeweg 2009), enables us to work together in the energetic domain, exchanging our experiences and drawing conclusions. It is important first to access the sensation through intuition and only after that engage the analytical mind to discern, translate and communicate the experience. This was one of the main lessons learned by Dr Robert Jahn and Brenda Dunne in their 28 years of Princeton Engineering Anomalies Research (Jahn & Dunne 2005). They emphasised how important it was to apply their analytical filters only after all the subjective intuitive data had been completely relayed. These are first-person qualities that create the conditions for someone to be able to receive information more accurately from the informational fields. There are many practices in the realm of personal development that help people to develop these qualities, most of which involve some level of directing your attention to your inner experience and noticing and accepting the busyness of the mind and the world outside while not getting caught up in it. Working with attention and intention is one of the main ways people can co-create with life. The first part of this section explores how that can look when working with other people, and the second explores more examples of co-creating with other entities. The formative force of life, the force that shapes our material reality, comes out of a process of giving something attention from the heart and bringing in creative intention from the higher mind (Andeweg 2009). If a leader is sensing well from the field, then they have an intuition about which general direction the community is destined to go in its journey to contributing the piece of the puzzle that it holds. With that general direction in mind, it is possible to co-create with life to bring it into form, through the conscious use of intention. In this sense, “leadership” is very much grounded in a perspective of co-creation, a continual cycle of sensing and acting. 1. Check whether your conviction is free and independent – are you really the steward of the entity you lead or are you dependent on others? 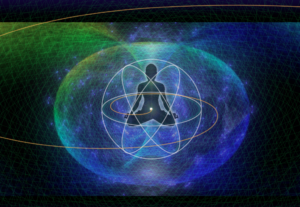 As we start to align ourselves with the informational and energetic fields, our relational and material architectures are called to come into resonance with them. That is likely to create tensions in our organisational systems which we need to learn to work creatively with. Practices such as Holacracy’s Integrative Decision Making (Robertson 2015) is one example of how people in organisations can treat tensions as information from the field, and work with that information in such a way that it can be of greatest service to the organisational entity that they are leading. The ability for a leader and community to be able to work creatively with tensions is critical, particularly in the increasingly complex and challenging times we live in. In holding a tension open, we keep the probability waves open, and invite in information and insights from the informational fields to literally in-form how we transcend them. The remainder of this section of the second person “We” looks at co-creation with non-human elements of life. The best example I have encountered of this is Machaelle Small Wright’s work on “Co-creative Science” (Small Wright 1997). Small Wright has developed a practice that she trialled with a garden, inspired by work at the Findhorn eco-village in Scotland, that involves explicit collaboration with entities in the angelic, devic and nature spirit realms. I described the Perelandra process in the previous Section. In the co-creative process, different players have different roles. The humans set the intention and vision. This is related to the longer-term human transformation process that is held by an angelic family she calls the White Brotherhood. 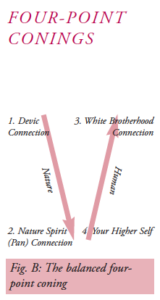 Together, the humans and the White Brotherhood are focused on holding an intention for the future so that life moves in that general direction, the e-volutionary process. On the other hand, there are the devas who hold the blueprint of how to implement such an intention in this reality for the greatest benefit of all life, and Pan and the nature spirits who are responsible for pulling all the pieces together – the in-volutionary process. Small Wright developed a set of protocols for interacting with these partners to help develop a physical garden or an organisational project (a “soil-less garden”), as well as to support healing processes (the Medical Assistance Program). This perspective is maybe the one most popularised due to people’s natural tendency in the scientific-rational mindset to orient through the third person. Although the framing of the examples of practices below is in the third person, as we shall see, they include first person and second person practices. The practice that I am most familiar with is that of ECOintention, developed by Hans Andeweg and Rijk Bols (Andeweg 2009, 2016). This practice was originally known as ECOtherapy and grew out of resonance therapy, which itself emerged from radionics, that was developed in the 1920s at Stanford University in California. All three methods use treatments (or “balancing”) at a distance through a map or photograph. I choose this one to focus on not only due to my experience of it, but also due to the 20 years of application and the related research they have done around it. From the various practices I am aware of, it is one of the most developed and researched in terms of impact on larger scale systems such as natural parks and organizations. Towards the end of the section I will mention some other practices in this area. The different methods that developed into ECOintention have become increasingly less technical with each step. In radionics only radionic equipment was used. 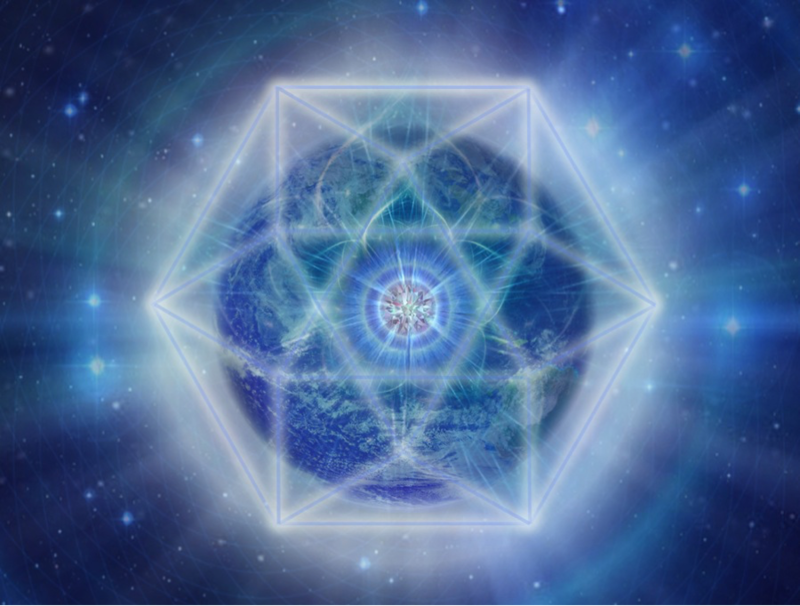 In resonance therapy symbols and fractals (mathematical images and formulae) were added. An ECOintention practitioner doesn’t use radionic equipment at all, but has a self-assembled energetic toolkit with colours, crystals, homeopathic treatments, Bach flower remedies, symbols and an orgone beamer. What is also important in ECOintention is that the owner, manager or guardian of the project is intensely involved in the balancing process. That is neither the case in radionics nor in resonance therapy. [The PhD goes into more detail on ECOintention in this section]. Other practices with similar intentions are well documented by Currivan (2005, 2017), Hardy (2008), Radin (2013) and Roney-Dougal (2010). From the endless possibility plasma. On the eve of the British referendum on membership of the European Union, at last some clarity emerges for me. I have been torn on this question, but in my meditation this morning, this insight dropped in. I have often used the concepts of pre-conventional, conventional and post-conventional but not in the sense that Lawrence Kohlberg originally used them. I have found them useful to describe the dynamics of a society. There is a conventional level where the mainstream resides and that we basically educate people to accept as the norm. In most industrialised societies that is essentially a world-centric modern mindset with increasing amounts of post-modern (Orange-Green in Spiral Dynamics value systems). Pre-conventional is centred in a more ethno-centric mindset (Red-Blue value systems) and is critical of conventional because it feels threatened in its national or ethnic identity by the increasing engagement with people who have other identities. Post-conventional is centred more in post-modern and integral worldviews (Green-Yellow value systems) and is critical of conventional primarily due to the institutionalisation of free-market capitalism that has plundered the planet and exploited the people for never-satiated economic growth. Herein lies my confusion of the past weeks. I have a post-conventional critique of the EU that sees it embodying the centralisation of an economic paradigm that is inherently destructive – colonising space for local economic innovation and self-reliance. What I really want to see change is that paradigm and system – and the EU is the perfect target. However, if I were to vote for the UK to leave the EU, I would be assuming that a UK outside of the EU would be more likely to adopt a post-conventional approach than if it remained. Much as I would like that to be true, unfortunately I don’t believe it is so. The predominant pro-Brexit voices are from the pre-conventional ethno-centric mindset, and are likely to dominate UK politics for years to come should they win. Which means I would vote for the UK to remain in the EU, for all my current misgivings, as it is currently the system that holds the greatest potential for the development of a post-conventional, integral praxis. Environmental issues for example are trans-national by their nature, and need to be handled in a trans-national space. The EU does have the opportunity and power to ban Monsanto’s killer herbicide Glyphosate, for example – something which is far better achieved in a trans-national policy arena that national. 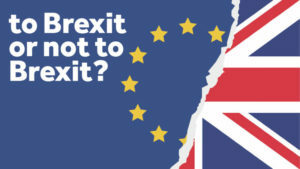 So for now I vote to remain – and continue to do what we can to make sure the right kind of decisions are taken at the level of the EU, and build the economic, ecological and social alternatives that will ultimately make the current conventional system obsolete. 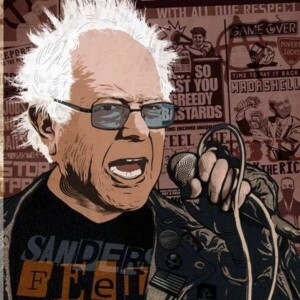 ‪#‎FeelTheBern‬ really captures it. Listening to him this morning, seeing the standing ovation, feeling how he was genuinely moved by that, seeing Clinton’s uneasy smile, frustrated by not being able to donate to his campaign living outside the US and reduced to liking and sharing Facebook posts, I decided to try and share what I feel is going on. I “felt the Bern” first during Jeremy Corbyn‘s campaign to become the new leader of the Labour Party in the UK. He had been written off in advance as being too radical, an old white man openly Socialist and a Campaign for Nuclear Disarmament supporter. The young people poured in to hear him speak. Why? He spoke a truth many of us have been feeling. For too long we have been disenfranchised by an expertocracy (economic, financial, political, health, education etc) telling us to leave it to them as they know better. Politics has become all about surface media displays with the differences between mainstream parties becoming increasingly blurred as our felt sense of our society becomes increasingly alarmed, depressed and disturbed. In our gut we have been feeling that things are fundamentally headed in the wrong direction and yet none of our mainstream political leaders have been giving voice to that (the Green Party has of course been voicing this for many years which is maybe why at last in the UK it is growing so rapidly). Until that is Corbyn and Sanders showed up. They have started to question some of the fundamentals that no-one else has dared to touch, probably because no-one really has the alternative fully worked out yet. But it needs to be named and made explicit as it is so alive in so many of us. We will work out the alternative as we go, because everything we need already exists. It’s so simple when you name it. If we have an economic system that doesn’t enable people to do the work that needs to be done in the world, then the economic system is broken. If we have an economic system that fails to honour everyone’s contribution in a fair way, then the economic system is broken. If we have an economic system that plunders and destroys the very planet that we live off and are part of, then the economic system is broken. If we have an economic system that treats potentially creative human beings like dumb passive consumers, then the economic system is broken. If we have an economic system that drives us to exploit and destabilise other countries and peoples to feed an insatiable engine of never-ending growth, then the economic system is broken. If we have an economic system that thrives when people get sick and purchase ever more expensive treatments that ultimately make them more vulnerable to disease later, then the economic system is broken. If we have an economic system that turns our schools and colleges into factories to feed an inhuman and out-of-control money-making system, then the economic system is broken. We created this economic system. A tiny elite now benefit from it and will fight tooth and nail to keep it in place. However we don’t have to accept it. Corbyn and Sanders are attractors for a movement that is demanding that our political leaders take back control of an economic system that is way beyond its sell-by date. But that movement also knows that if the establishment fails to allow change at the political level, we will continue with ever more commitment and vigour to build a new system that makes the old one obsolete – a system so different, that before they know it, it will be beyond their grasp and control. A system that enables people to contribute their talents to co-creating a world that we feel in our guts is a world worthy of us, as amazing creations of this beautiful planet we live on. This course and my own experience during the period of this course brought me to a thesis that I will expand on in this paper. The thesis is that as we shift our interior experience and patterns, so the world around us changes. On top of that, the reverse is true – as we create change in the information fields of the world around us, so that is reflected in changes in our interior experience and nervous system. This is why I have chosen to connect neuroscience and eco-fields, and why I selected Hermes’ “as within, so without” quote as the subtitle. The two main faculty members of the course also reflect these two aspects – Jim Hickman on neuroscience and Will Taegel on eco-fields. If this thesis proves to be true (and there is a lot more work needed to develop it) then it will give us a way to navigate hypercomplexity grounded ultimately in our own choices about how we relate to ourselves, each other and the world around us. Note: this blog is a draft of a booklet that I hope to see published one day. I also have a version with some more explanatory text in each section. This book is dedicated to Hans Andeweg and Rijk Bols, who have pioneered the field of ECOtherapy (now called ECOIntention), as well as to those people present and future who embark on this sacred work. The inspiration and much of the content of this book comes from the writings and work of Hans Andeweg, in particular Scheppend Leven (2011) – due out in English soon as The Universe Likes a Happy Ending. I have filtered the concepts through my own experience to come up with the twelve principles. Peter Merry is a leader and social entrepreneur who has spent most of his adult life in an ongoing quest for how to be of greatest service to the transition towards a more life-affirming future for people and the planet we inhabit. On that journey he has been a theatre director and actor, a teacher of English in Paris and northern Ghana, an environmental activist and International Co-ordinator of the Green Party of England and Wales, a MSc student in Human Ecology, an international youth trainer, co-founder of the business Engage!, an organisational development consultant, public speaker, founder and Chair of the Center for Human Emergence Netherlands, PhD student with and Director of the Wisdom University in Europe, husband and father of three boys. In the energetic realm, he has trained in clairvoyancy and geomancy, and is currently completing the four year vocational training in systemic energy tuning with the Center for ECOtherapy. He lives in the ecological neighbourhood Eva Lanxmeer, in Culemborg, the Netherlands, with his Dutch wife and three children. As we stand on the edge of a new era, with old beliefs, institutions and values crumbling around us, a new realisation is dawning in the minds of many. This is not just an upgrade of our current civilisation. This is a new starting point. From this point on, the foundational assumptions of our civilisation change.